Below we talk about the three most common types of fishing weights. 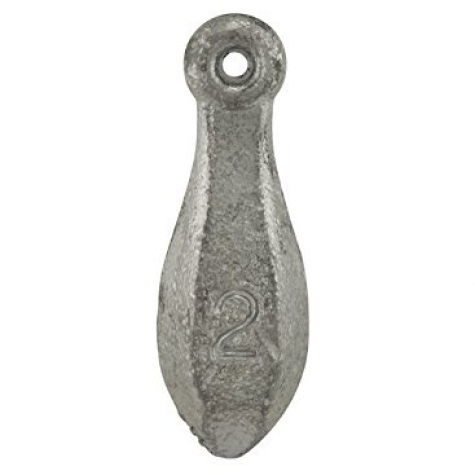 The egg sinker is one of the most commonly used fishing weights. Think of it as an egg, with a hole in the middle where your fishing line can slide through easily. This fishing weight is a large piece of lead with a loop at the top. You can connect this weight with loop of fishing line to a snap swivel, or a three way swivel. You can also use rigging bands to connect this type of weight so that you can break it off when a fish is thrashing next to your boat. Picture of split shots via AWS and Google Image Search. The split shot is a great invention. Split shots can be opened with a pair of pliers, you then put the weight around your line and squeeze it snug to the line with a pair of pliers. A pyramid sinker resembles a pyramid with a small loop which protrudes out of its top. This loop allows for you to easily clip this weight to a snap swivel or a loop of mono. This is a great weight to use for surf casting, or for sabikis. Rubber core sinkers are great in that they are a very easy sinker to attach. Unlike a split shot, you don't need a pair of pliers to use this type of sinker, simply pull the rubber out, insert your fishing line, and you are good to go. Trolling weight via Google Images. A trolling weight is a weight that can be used to keep a trolled bait well below the surface. Many anglers use this type of weight for methods such as high speed trolling for wahoo, or slow trolling for bottom fish.